Bike Park is a 16 acre park which serves as a space to ride mountain or BMX bikes near downtown Grand Rapids. Formerly a neglected softball and baseball facility, it now contains a pump track and a single track mountain bike trail through the woods near Plaster Creek. The Bike Park was built and is maintained by volunteers in the Grand Rapids biking community as well as the Grand Rapids Parks & Rec department. These items are numbers 1, 2 and 3 in the concept plan below. In addition, volunteer efforts will be used to groom a single track interior loop trail through the woods as noted in the northwest area of the concept plan. 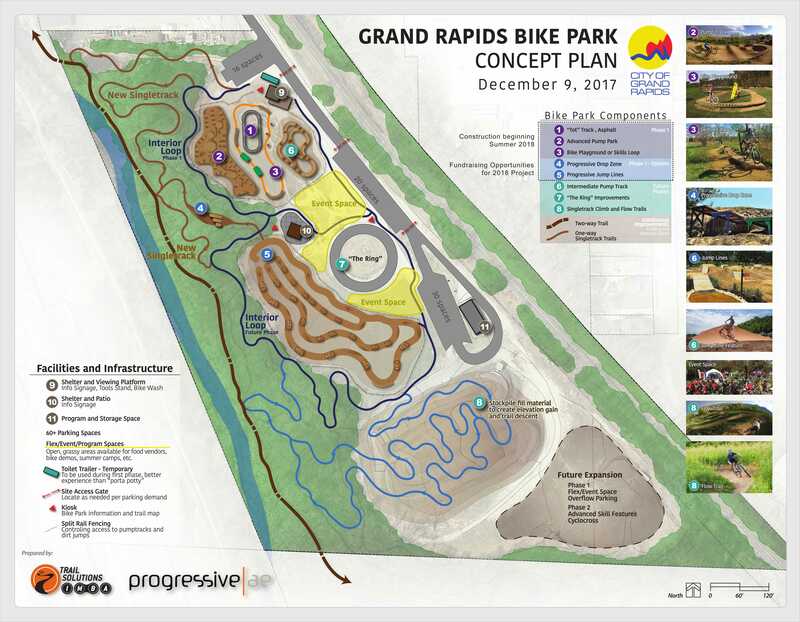 Beyond the millage funded improvements, the City of Grand Rapids Parks and Recreation department, West Michigan Mountain Biking Association and Friends of Grand Rapids Parks are working together to help raise additional funds to bring even more elements to the park. The goal is to raise an additional $100,000 to add a progressive drop zone and progressive jump lines (numbers 4 and 5 in the concept plan). With these improvements, Bike Park will have amenities for a wide range of users from toddlers and beginners to advanced adult cyclists. Additional amenities will provide opportunities for walking and running through the wooded trail that runs along the back of the park and provide more access for bird watchers to spot birds in their natural habitats. We will be activating the use of this underused space by creating programming that engages the community youth in a mountain bike program, bike events such as races or competitions throughout the year. Additional activation will include creating unique learning opportunities for students at nearby schools to engage in education about nature with access to natural surface trails and water through Plaster Creek.